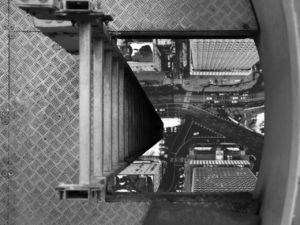 Image description: A black and white photo of a city intersection taken from the top of a tall metal ladder. 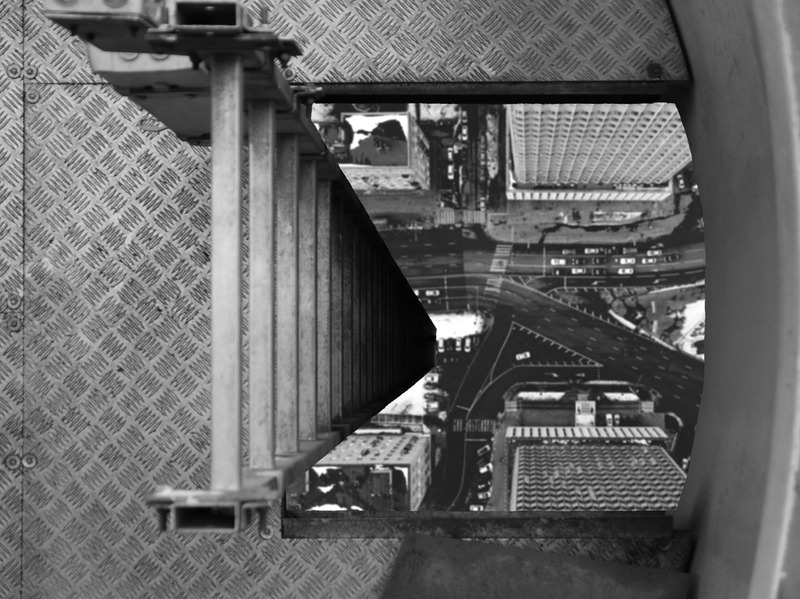 The view of the street is framed by tall buildings below and a landing of corrugated metal surrounding the narrow hole through which the ladder descends. CC0 Public Domain image by Alexandra on Pixabay. It’s been over a year since I last wrote a blog post, and what a full year it’s been. A busy job search ended and my new job began. I moved. I got some new research off the ground, published some stuff, sent some other work off for review (fingers crossed). There was even reading for fun and lots of good time with my people and heartbreak and resolve and other fine things that’s stuff for another blog. It’s strange to think back to where I was–we were–this time last year. Seems like a really long time ago. Taking stock is a necessary step for moving forward. In the interest of making progress on this blog and on that new research program I mentioned, I thought I’d offer a round-up of where I’m at with #intersectionalND and my investigations into the intersections between neurodivergence and other dimensions of difference. The last time I posted here, I was just launching the #intersectionalND hashtag and monthly Twitter chat. I wanted to create a node for conversations about intersectional neurodiversity. I wanted to connect with smart folks talking about the impact of intersectionality and neurodiversity in their lives and in society. I wanted Data that would help me to better understand the ways in which identities overlap, interact, and position people in their relationships, in organizations, in politics. And I wanted to deepen my understanding of neurodivergence, which until then I’d mainly explored in isolation. I’ve now curated an archive of nine #intersectionalND chats on Storify. Eight of the chats archived were monthly chats and one of them was a live-tweeted interactive panel discussion at the 2016 National Communication Association convention (more on that below). Some of the chats were pretty well-attended, often by people I’d never met and many whose work I admired. And some were just me, talking to myself. Either way, these conversations were very valuable for me, and I loved the ease with which I was able to facilitate and save these conversations through Twitter and Storify. It’s interesting to note which chats took off and which ones floundered. Part of this is likely due to my poor advertising skills. I tended not to promote chats enough or at optimal times or sometimes much at all. But part of the imbalance in chat participation is telling, I think, of the ways in which certain intersections are granted precedence over others, for various reasons which I’m only starting to tease out. Anyway, chats on intersectionality in #theory + #praxis, #neurodiversity + #gender, and #Election2016 were the best attended. I was surprised to be the only one talking about #neurodiversity + #policebrutality given the amount of coverage reporting on disability and neurodivergence status of unarmed men killed by police at the time. I also expected more folks to want to talk about #neurodiversity + #race and #neurodiversity + #sexuality given recent calls to pay more attention to these intersections. I organized a panel on Intersectional Neurodiversity in Activism, Scholarship, and Pedagogy for the 2016 National Communication Association Convention which was basically an #intersectionalND Twitter chat in meatspace. Panelists included me, Morénike Giwa­ Onaiwu, and Jessica Benham (Shannon da Vanport was slated to attend by unfortunately unable to make it), and the discussion was live-tweeted by Nicole Henninger and Mandy Paris. You can read the original panel proposal here. The best part about this discussion–apart from sitting next to panelists I greatly admire and engaging in a lively conversation with a roomful of thoughtful participants–was that we actually discussed some practical strategies for building thicker intersectionality in activism, scholarship, and pedagogy. So often, conversations about “intersectionality” are frustrating to me due to the fact that talk about theory rarely leads to more practical conversations about what to do with an increased appreciation for the ways dimensions of difference intersect. At NCA, we talked about the value of visibility and the fact that visibility only gets you so far. We talked about making small, everyday shifts in the ways we communicate, sharing knowledge, being a good ally, fostering fruitful collaboration. We talked about how intersectionality feels, the way it’s experienced as forced compartmentalization or pivoting from one perspective to another. We also shared ideas for good resources, like Margaret Price’s Mad at School; Presumed Incompetent: The intersections of race and class for women in academia edited by Gabriella Gutiérrez y Muhs, Yolanda Flores Niemann, Carmen G. Gonzalez and Angela P. Harris; Inclusion BC; Deconstructing Privilege: Teaching and Learning as Allies in the Classroom, edited by Kim Case; and the work of Fiona Wittington-Walsh. Thanks in part to a hectic end of semester post-NCA (teaching 5 classes is no joke) and inertia post-break, #intersectionalND is now on winter hiatus, and I’m not sure if I’ll resurrect the chat this spring. I’ve been toying with the idea of holding Twitter interviews instead of chats. Or perhaps a mix of both. Whatever form it takes, I certainly want to continue to promote the hashtag as a node for conversations about intersectional neurodiversity. If anyone reading this wants to get involved, I’d welcome some help with signal boosting, brainstorming, and modding #intersectionalND moving forward. One reason that I’m on the fence about resurrecting #intersectionalND as a chat is my need to do more out in the world. Now that I’m relatively settled in my new locale, I’m looking for organizations and pockets of movement that are leveraging intersectionality for progressive social change. I’ll also be getting back to my intersectionality reading list this summer, so get in touch if you have any recommendations for my ever-growing list of Things To Read or tips about folks doing good work in the Reading/Lancaster/Philadelphia area. Not bad for one year in on an experimental research project that I wasn’t sure would take off at all. I’m excited to see where this research will take me by this time next year.